Many of the best sports broadcasters were once players. 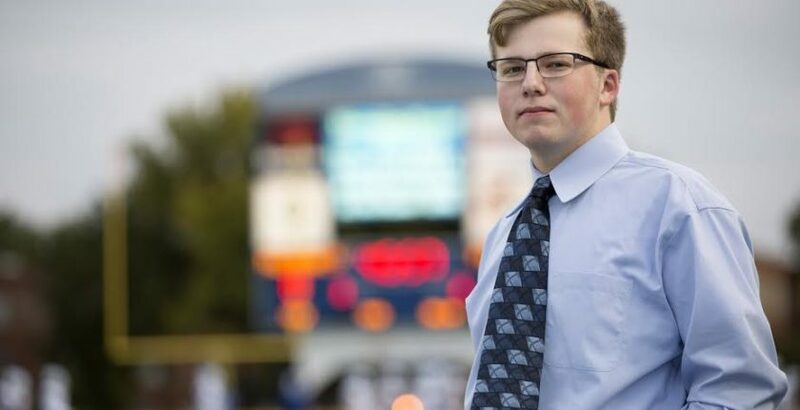 In this case, senior Kearney Bearcat, Geoff Exstrom — who’s is also a part of the Bowling Club and National Honor Society — found his passion and soon-to-be future career after trading in his jersey for a microphone. 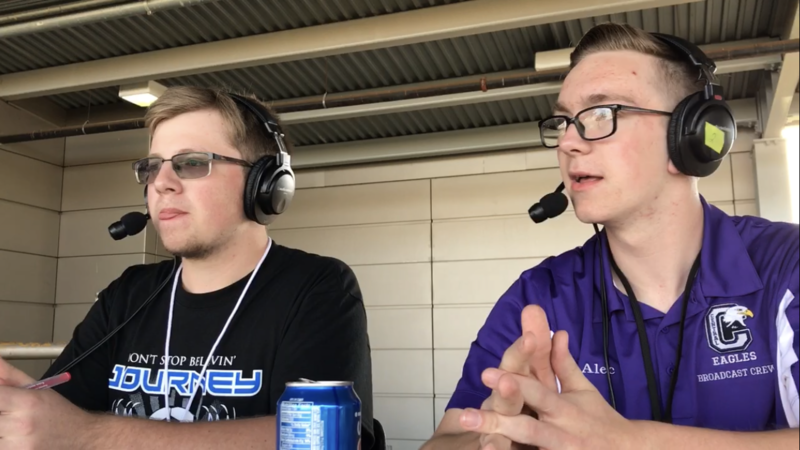 With a voice for broadcasting and a background in sports, Geoff’s football coach suggested that he become the voice of Kearney High during his sophomore year of high school. 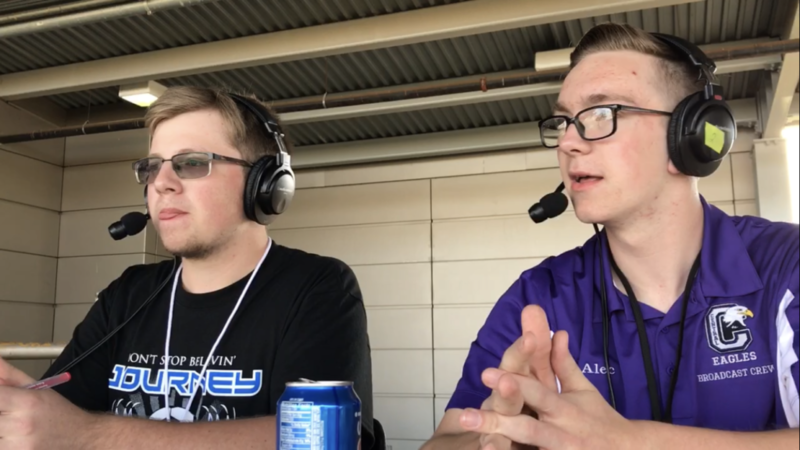 The rest is history as Geoff turned his new-found passion into a full-time student activity, calling all football, basketball, wrestling, soccer and volleyball games for Kearney. Geoff is a busy Bearcat. He took the role as Public Address Announcer for many of the Kearney Legion Runza Senior team’s games this summer, called the KHS Powder Puff Championships this fall and broadcasted the 2016 KHS Student-Staff Basketball game last winter. As a junior, he was one of 25 students selected to be part of Youth Leadership Kearney, a program considered to be one of the most prestigious programs outside of Kearney High. Geoff is a student who goes above and beyond to get the best sports coverage for his school. He recently started conducting postgame interviews. While Geoff keeps himself busy with Kearney’s sporting events, his journalism goes farther than broadcasting. He is a sports writer for Kearney’s magazine, The ECHO and host of his recently created podcast, BSN 2.0. He shared his excitement to interview a variety of people from both Kearney High and those from around town. Geoff had the rare opportunity to attend a High School Media Innovation Camp at Arizona State University. Selected out of 130 applicants, Geoff’s 2-week stay at one of the nation’s best journalism schools allowed him to gain a greater knowledge of the broadcasting world. While at camp, he covered the minor league soccer team, Phoenix Rising, met famous sportscaster, Al McCoy and got an overall taste for what it’s like to work at a news station. Geoff credits his Media Productions II teacher, Mr. Robb Goff for much of his success. He described his time in Mr. Goff’s class as, “instrumental” where he can be creative and get his work done. Geoff expressed gratitude as he explained Mr. Goff’s willingness to sacrifice his personal time to stay after school and help with weekend games. A future Kearney Loper to be, Geoff is looking forward to furthering his passion by studying Sports Communication and jump into broadcasting Loper sporting activities next fall. Geoff is an excellent Striv student, to say the least. We enjoy following him on social media as he continues to excel time and time again. We wish Geoff the best of luck with the rest his senior year, his endeavors at Kearney and future career! We know you will do amazing things.